Why is it that cereal boxes for kids are often designed with quirky colorful mascots that seems to stare back at you? There could be a reason for that according to a new study. 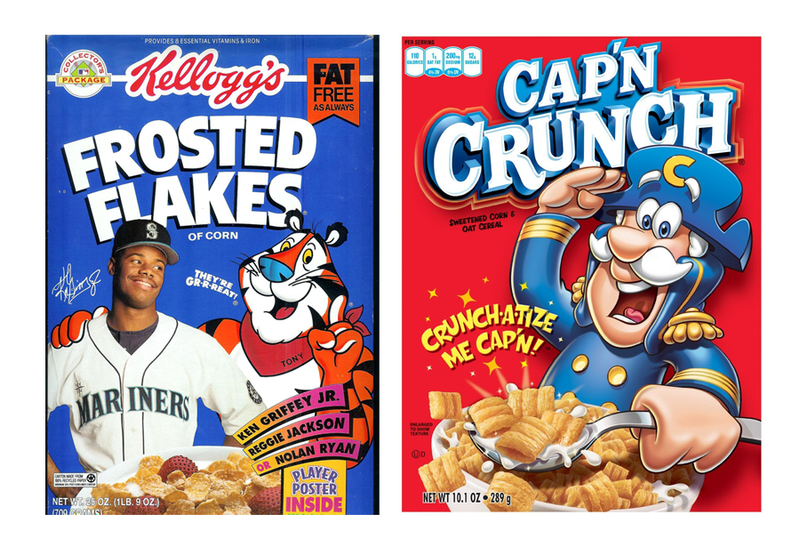 Whimsical and fun as they may seem but Cap’n Crunch and the rest of the cereal box mascots (or spokes-characters as they are called) may not only be there to make breakfast a fun activity for your kids. As it turns out, cereal boxes might be designed in such a way that it would appeal to your kids on a deeper psychological level as suggested by a Cornell University Food and Brand Labs’ recent study. But before we delve down to the study, we would like to ask you folks on how does each cereal box make you feel? Source 1 | Source 2Thanks to the hardworking folks from Cornell University Food and Brand Lab, they might have finally found out the reason why these cereal characters are often found to be staring downwards. Not only that but they have also found out the reason why most children’s breakfast cereal are often placed on the lower part of the shelves while adult breakfast cereals are on top. By conducting two studies the researchers from Cornell University have found out that the characters on cereal boxes are designed in such a way because they have to make an eye contact with the person browsing through the grocery aisles. Their findings goes for both of the children’s and adult’s breakfast cereal but the practice is prominently done for children’s cereals. According to the first study, the average height placement for the children’s cereal box is 23 inches high whilst adult cereal boxes are placed 48 inches higher. The study has also found out that the average distance of view these cereal boxes is four feet away from the shelves. 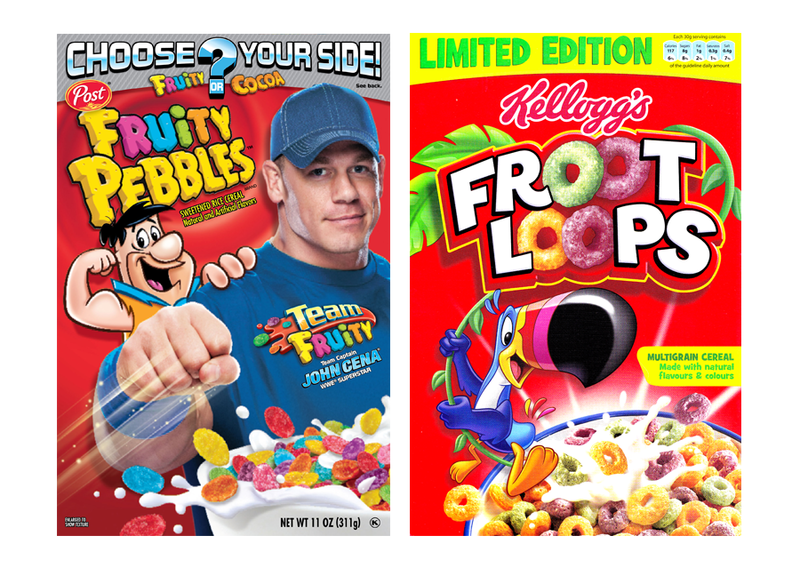 By combining the height and the angle of how the cereal spokes-character look creates the incidental eye-contact depending on who is the cereal brand marketed to. You might be wondering what is the connection between making eye-contact and cereal boxes? As it turns out by making eye-contact it helps in influencing the feelings of trust and connection to the viewer. In order to further prove this, the Cornell researchers has asked the help of 63 individuals to review two boxes of Trix. One variant of the box shows that the rabbit is looking straight at the viewer and on the other variant the rabbit is just looking down. The 63 participants are then asked to rate their feelings as well as their connection to the cereal box. Surprisingly, the variant wherein the spokes-character is looking at the viewer is 16% higher in terms of brand trust whilst the brand connection is 28% higher than the variant whose spokes-character is not looking back. 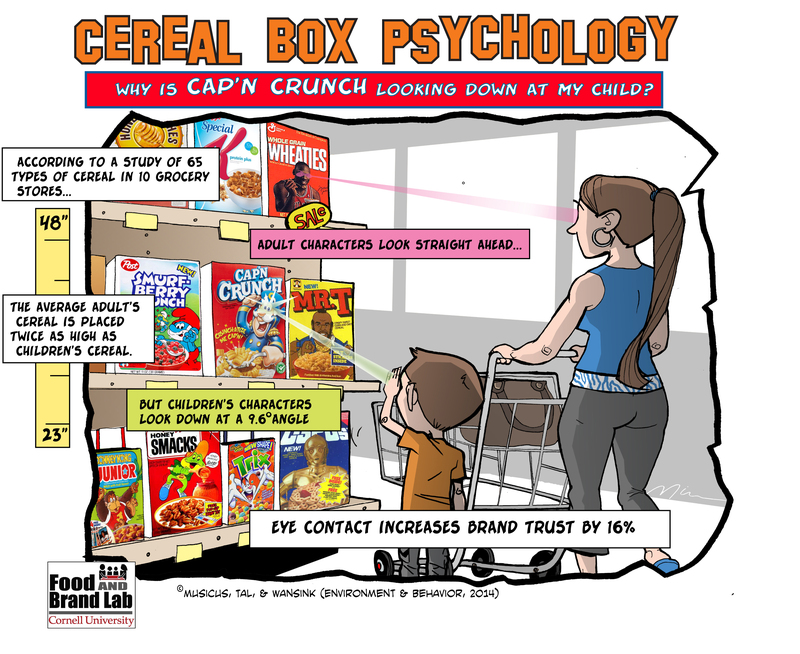 This study only shows that cereal box spokes-characters that make the incidental eye contact with it’s intended audience can help in increasing the positive feelings towards the brand which in turn also helps in increasing the likelihood of the consumers to buy the product. 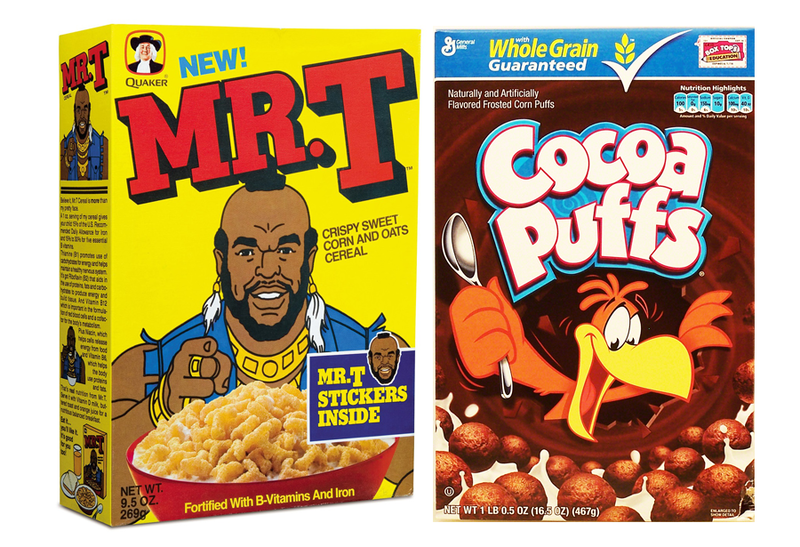 While there are no confirmations from cereal companies if they are deliberately doing this but one key take away as mentioned in the study is that it could be used to design cereal boxes that are much healthier than the ever beloved Cocoa Puffs.